When the mountain scenery just isn’t relaxing enough. 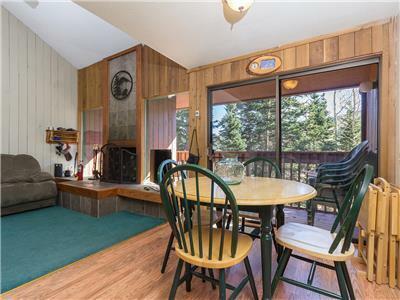 2 bedroom unit on ski out deck. Two queen beds, and a pull out sofa. Unit sleeps 5-6 comfortably. Kitchen is stocked with most all basic needs. There is underground parking for your convenience. THIS UNIT IS ON THE 1ST FLOOR WITH 2 FLIGHT OF STAIRS. THERE IS NO ELEVATOR IN THIS BUILDING. Newly updated one bedroom condo. Queen bed and queen pull-out sofa makes it able to accommodate four people to sleep in this unit comfortably. Kitchen is stocked with basic needs. THIS UNIT IS ON THE 2ND FLOOR WITH 4 FLIGHTS OF STAIRS. THERE IS NO ELEVATOR IN THE BUILDING. NO PETS ARE ALLOWED IN ANY COPPER CHASE UNITS BY RENTAL GUESTS. IF YOU BRING A PET, YOU WILL BE CHARGED A $250 FEE, PLUS A $50.00 PER HOUR FEE TO CLEAN THE UNIT YOU BRING A PET. NO EXCEPTIONS. 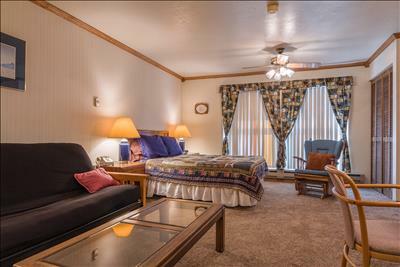 Each of our studios located in Brian Head, UT are unique and have different specifics to offer all of our guests. Perfect studio in the main lodge close to the pool. This unit has been remodeled with Southwestern decor. It has a Queen size bed and a Queen size pull out sofa. Don’t miss out, this one is great for families. Easy elevator access and just one floor above the main lobby. Great ski out ability to Navajo, and breathtaking mountain views right from the window. This 1950 sq ft, luxurious property is located directly across from the Giant Steps Lifts at The Lofts. Easy access with a 1 car garage and plenty of room for parking. 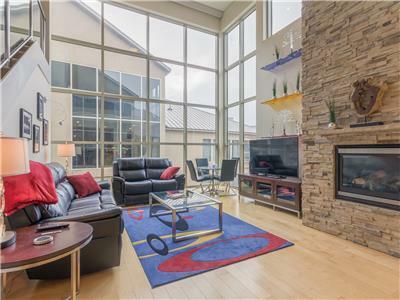 The Loft style condos offer an open living environment with 20 ft ceilings & glass front windows so you can have a majestic view of the Giant Steps ski runs & Brian Head Peak. You will have the feeling of WOW right when you enter this unit. 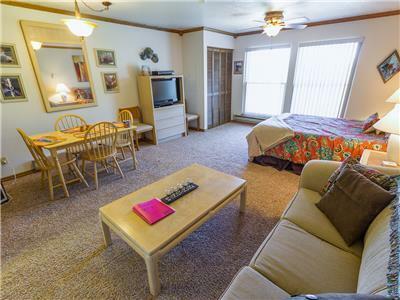 Two Bedrooms-Master upstairs with King bed, and full bath with jacuzzi tub and shower, downstairs bedroom has King bed with access to full bath. The loft has a Queen sofa sleeper, a Queen Electric Air Mattress and Bed Frame and a Half Bath. The Kitchen has an electric oven, gas stove top, microwave, dishwasher, full-size refrigerator/freezer/ice-maker, trash compactor. Kitchen dinnerware includes 12 large and small plates, cups, glasses, water and wine glasses, and utensils, cooking utensils, knives, pots/pans, crock pot, skillet, bakeware, timed coffee maker, K-cup Keurig, toaster, blender, mixer, air popcorn maker, cutting board. Kitchen table seats 4, dinette table seats 4 and counter bar seats 3. 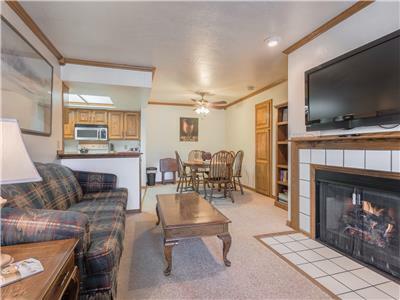 Living Room has recliner sofa and recliner love seat, flat screen TV, Apple TV, DVD player, gas fireplace, board games and DVD movies. Both bedrooms have flat screen TV’s. Loft has Pro-Form Tour de France bicycle, wet bar, mini-fridge, flat screen TV, Wii console and games, and DVD player, desk and HP office jet printer, Foosball game table Internet WiFi and cable is available. 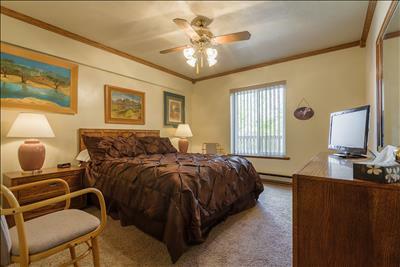 Central heating and ceiling light/fans throughout. Full-size washer and dryer, iron and board, two cool-mist humidifiers, blower dryers and electronics safes in both full baths. All bed linens, towels, comforters and blankets provided. 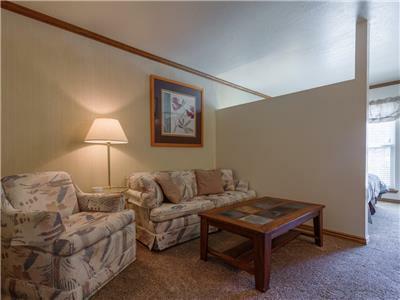 Attached garage, Lower patio deck with propane BBQ grill and dinette set, Upper patio deck with hot tub Jacuzzi. The open and spacious living room has spectacular views right from the windows that will leave you breathless. This spacious unit can accommodate up to 8 people comfortably. You and your family or friends will make memories to cherish for years to come! This is a nice and comfortable unit. 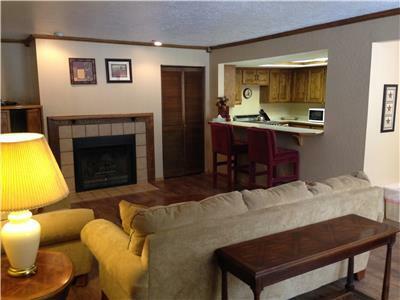 It is very cozy and in the main complex to all the Copper Chase amenities. It has a Queen size bed and a futon pull out. Each of our studios located in Brian Head, UT are unique and have different specifics to offer for our guests. 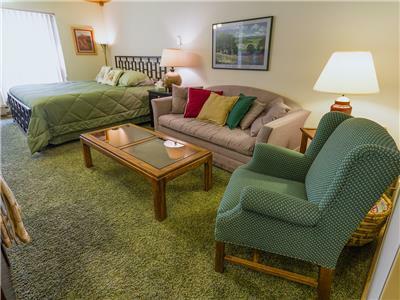 This unit offers a Queen size bed and a Queen pull out sofa. There is a privacy wall between sleeping quarters. Has a basic stocked kitchen just bring your food to enjoy a nice dinner staying in. 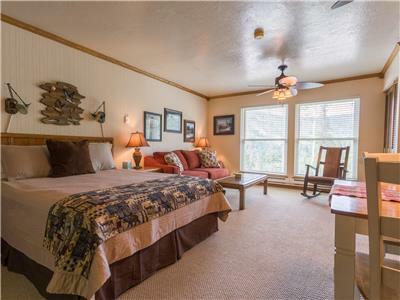 Enjoy the mountain views right from the comfort of this studio. 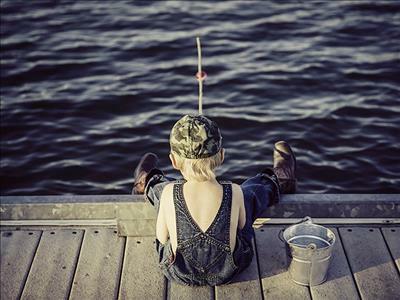 Enjoy Brian Head’s new pond, stocked with fish ready to catch!